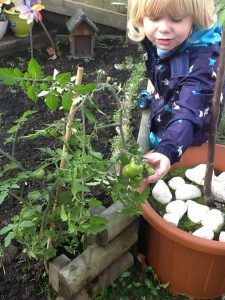 Over the summer our tomato plant has grown very big, we had to put a large stick in the soil to help support the plant so that it can continue to grow. 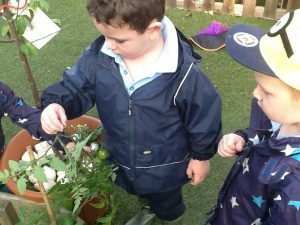 The children have enjoyed observing our tomato plant and picking the tomatoes off to explore. 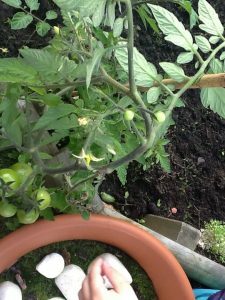 Today, Frankie, Gary and Gatsby enjoyed exploring the tomato plant. 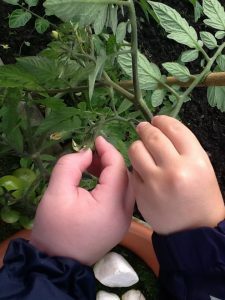 Gary said ‘wow look at the tomato plant!’ He carefully picked up the tomatoes and held them in his hand. Frankie said ‘wow that’s loads’ and touched them too. 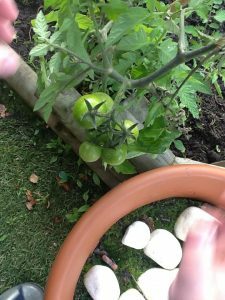 Gary said ‘they feel very hard’ and Frankie said ‘they are very cold.’ Gatsby crouched down to look more closely at the tomatoes ‘here are more tomatoes’ he said. Gatsby then picked a tomato off and held it in his hand. 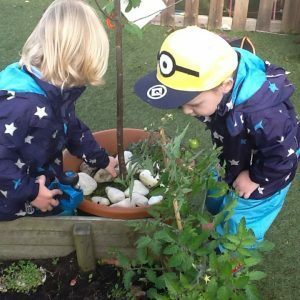 The boys all then attempted counting the tomatoes to find out how many there was! 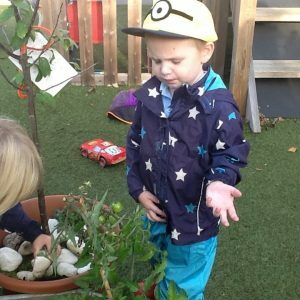 Well done boys, we enjoy observing our plants in our nursery garden and we love to explore and investigate! Please direct enquiries to Miss Jewell.